Service-Learning Project Ideas Related to Community Helpers: This list of service project ideas and resources are designed to spark ideas for actions related to recognizing the contributions of veterans and people who serve their community in a variety of ways. Research the acts of local community heroes, people who have taken generous personal action for the sake of the community. Write their stories and publish in a book of local heroes to present to the local library or school media center. Create a Wall of Heroes with the information. Write kind notes to people who provide a regular service. Be specific and respectful in the letters and let the people know that they are appreciated for what they do. This may include a crossing guard, a school volunteer, a letter carrier, the receptionist at the orthodontist office, a choir or youth leader, or the principal at your school. 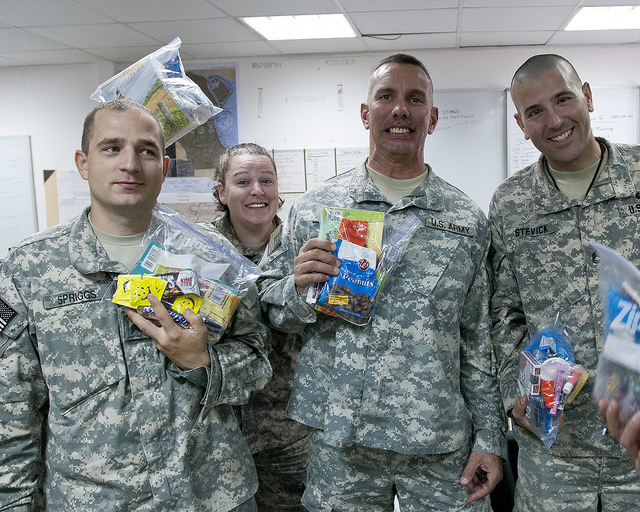 Prepare care packages or make greeting cards for soldiers. Investigate the skills and training required to have a career as different community helpers. Create cards or banners, make a lollipop bouquet, or make and deliver snacks for local firefighters, police, and first responders to thank them for their service. Set up a booth at a local shopping center and have people make cards for military personnel. Invite community helpers or military personnel to have a discussion for your class. Encourage your students to ask them questions. Have your students participate in a military or police style physical training exercise. Ask them about their expectations and their reactions. Involve your students as conversation partners for aging veterans at a local hospital or center. ​​Find partners in your community who will work with your students on veteran and community helpers projects. Engage the students in investigating the issue and calling the partners. Connecting with a community resource makes the project more meaningful and impactful. Go to generationOn.org for a full menu of project plans related to veterans and the military. See a list of great projects for Kids and for Teens. This link provides a lot of background information about all of the branches of the US military. This would be a useful resource to show your students so that they can understand the similarities and differences of the armed forces. This website has pages that detail different jobs that help the community members. These descriptions would be particularly helpful for elementary students learning about community helpers. The VFW's website has information about the organization, their initiatives and how to participate. There is a specific section about community service and this would be a great resource for your students to get involved. This organization works to assist injured service members. They have programming and events to further their mission and involve the community. Wounded Warrior Project would be a good resource for your students to research. YouTube- What Should I Know Before Pursuing a Career as a Police Officer? On this video Officer Jack Richter tells viewers about the expectations and requirements for becoming a police officer. He provides examples that will help your students better understand the career. Homeschool Journeys. "Veterans Day Printables" homeschooljourneys.com, 2012. Web. Teacher Created Materials & Education World. "Veterans Day" educationworld.com, 2014. Web. Webquest Military & West Hartford Public Schools. "Explore the Military" whps.org, 2015. Web.